So, how do you prepare for something that you don't really know how to prepare for? The answer for us was easy. Go back to what you love - the Sing-along version. We looked over the schedule that was released just a couple of days ago and we started to map out the schedule we would like to follow during Comic-Con. With less than a week before Comic-Con we decided the solution to preparing for next week was to rewatch (for the millionth time) Buffy the Vampire Slayer the episode in which Buffy and the gang are all under a musical spell. Even if you were not a big Buffy the Vampire Slayer fan, this episode is a ton of fun to watch. The music is great and the story line is fun. 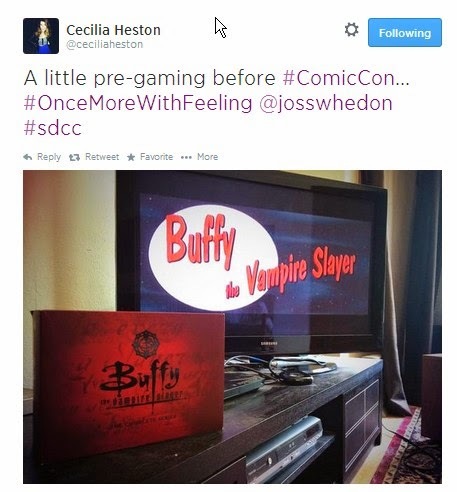 The idea of finding something in the world to be passionate about (as in the case of Buffy who seems to have lost her Mojo) is something that we can all relate to whether we are vampire slayers or not. 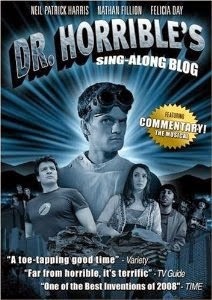 The other musical that I will rewatch prior to Comic-Con to get psyched is Dr. Horrible's Sing-along Blog. The common denominator between these two musicals is Joss Whedon. This is pretty wild to me because for the most part, in the world today, we like to put people in just one box. You are a writer, or a banker, or mechanic, or a certain type of worker. The concept of the Renaissance man / woman is not something that we always want to accept. We accept the term "Multi-Task" but we commonly want those tasks to be working toward one project. But Joss Whedon really is a Renaissance Man. His writing / directing is brilliant and then he writes music that is lyrical and tells a really interesting story. He directed the Avengers and then went from there to direct Much Ado About Nothing, filming it at his own home in a matter of a couple of weeks. He also wrote the music that is heard in this version of the Shakespearean classic. Much Ado About Nothing has been done a number of times before on film and so you would think that it's been done. I have seen at least 5 different versions of this play. It's a fun story of romance and misunderstandings and mayhem. If you have seen this play before you will really enjoy this version. If you have a teenager and would love to introduce them to Shakespeare this is the perfect intro because it is a Joss Whedon production. My teens sat through the entire thing. They loved it and it led to some great conversations. I highly recommend getting this for your personal collection on Blu-Ray because the bonus features, that include how this version came together, are possibly even more interesting than the Main Feature itself. All of the performances were fantastic and interesting. The hero was silly, the villians were villianous, and the inspector Dogberry was brilliantly inept. The performance of Dogberry by Nathan Fillion is without a doubt the best Dogberry I have ever seen. His performance was subtle yet brilliant. To me it was perfect. It was fun hearing interviews with Nathan Fillion about how nervous he was about playing this role and how he almost didn't do it. Perhaps those concerns were just the thing needed to make this performance as good as it was. So, yes, we are huge Joss Whedon fans. Who would have thought singing along with Vampire Slayers and crazed scientist villians could be so much fun.